“Do you have any info on Washington DC or Northern VA Go association?” asks Jonathan Kim. 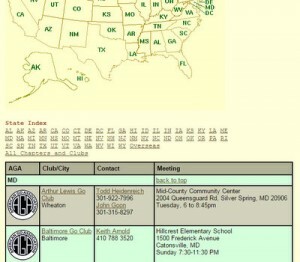 Click on a state here to see a list of AGA chapters and other clubs and meeting places for go players in that state. Official chapters of the American Go Association are indicated by the AGA logo. Click on a chapter or club name to visit their webpage, if available.